I’ve used the usual free-standing table top fume extractors, but they’re noisy and always seem to be in the way. So, when I was reconfiguring my bench, I built the extractor into it. It consists of a cheap $10, bathroom vent fan with a couple of PVC connections from the intake that run through the front of the bench. From the exhaust side, a long pvc pipe runs along the back of the bench, and blows it against the floor 6 feet away. Sorry, no pictures of the steup on the back of the bench… although it is on wheels, the fully loaded bench weighs a few hundred pounds, so I don’t move it often. The intake is Loc-Line anti-static vacuum tubing, from loc-line.com This is a series of 2.5 inch diameter, hard plastic segments that interlock to make a flexible tube, and capped with a rectangular nozzle. Part numbers: 81302AS, 81304AS. Nothing fancy, there’s no trim ring around the intake. The switch on the left of the intake controls the fan. 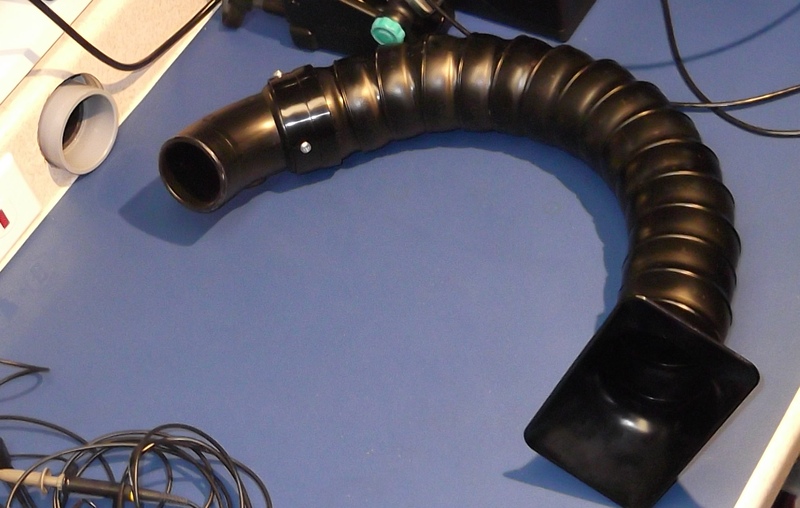 The flex-tubing is connected to a PVC elbow, that elbow is just press-fit into the intake. This has worked well, it is easy to remove and to adjust. I was using the Hakko FX-951 units, but upgraded to JBC. Here’s the JBC DIT and JBC compact with micro-tweezers. At the back-right is a DS-983A solder dispenser. On the left is the intake for the fume extractor. 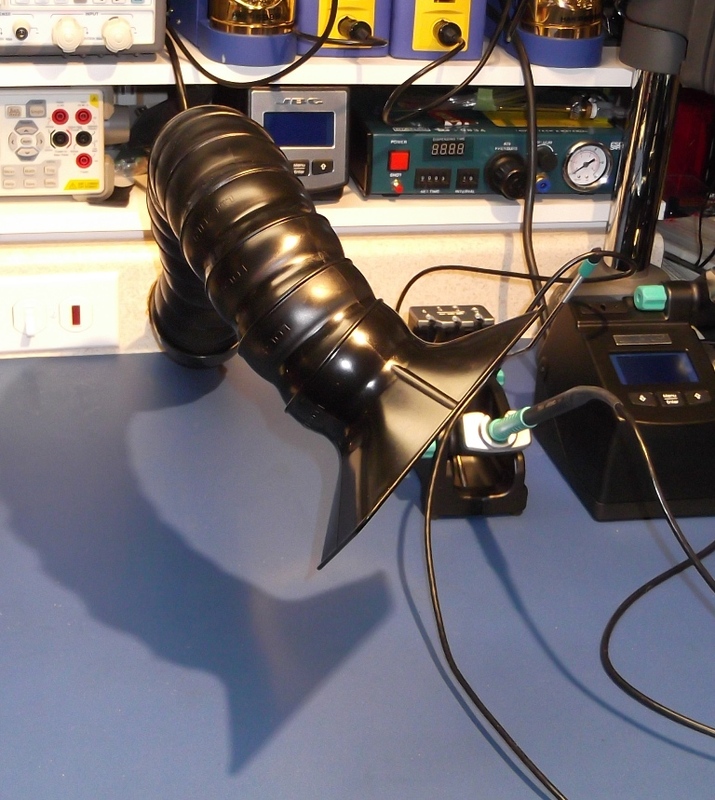 The rework equipment, a CSI-474A desoldering gun, and a CSI-825A+ hot air unit. 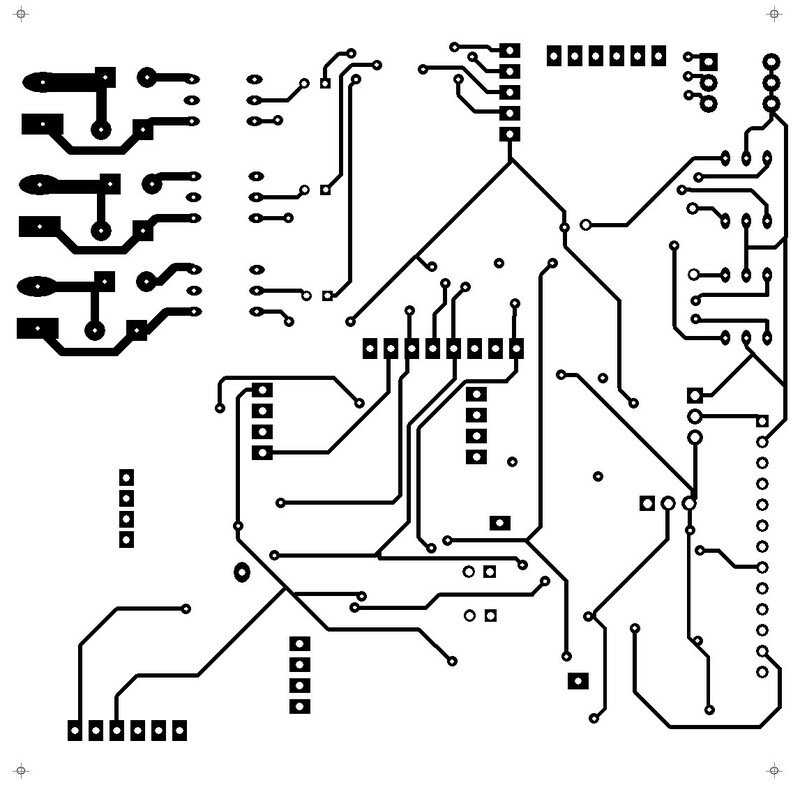 The control board design is complete, ready to etch it and see if it works… With 127 components (352 connections) there’s probably a Vdd or Gnd trace missing somewhere. And the top and bottom layouts, without the copper pours. To control noise on the digital lines, the bottom layer will be as continuous a copper pour as possible. New Mantis Compact inspection scope arrived, with articulated boom arm. The Mantis on the left with the standard binocular AmScope on the right. 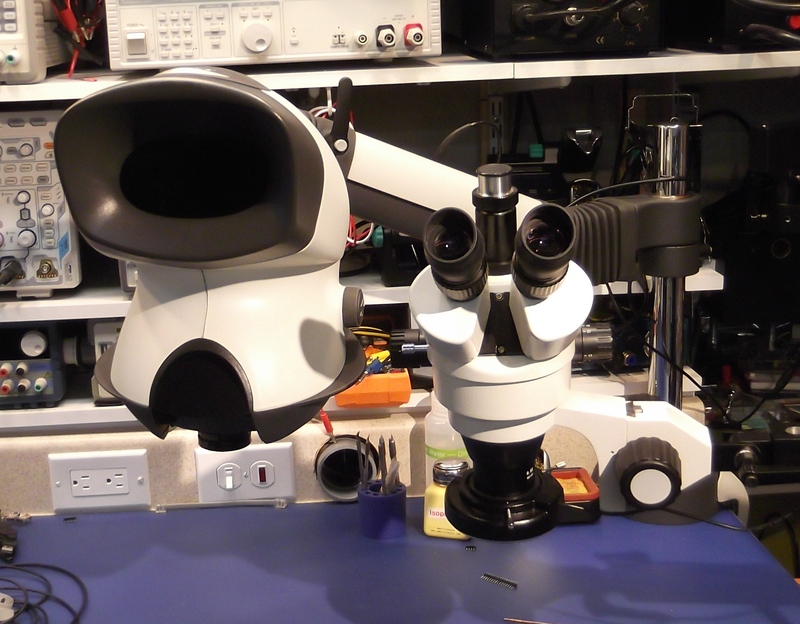 This scope provides a great 3D view, without peering through little eye pieces. The Mantis provides a much sharper image than the Amscope’s optics. And you can shift sligtly while looking through the Mantis and change your perspective of the board, this is very handy for getting a better perspective when working on small devices. 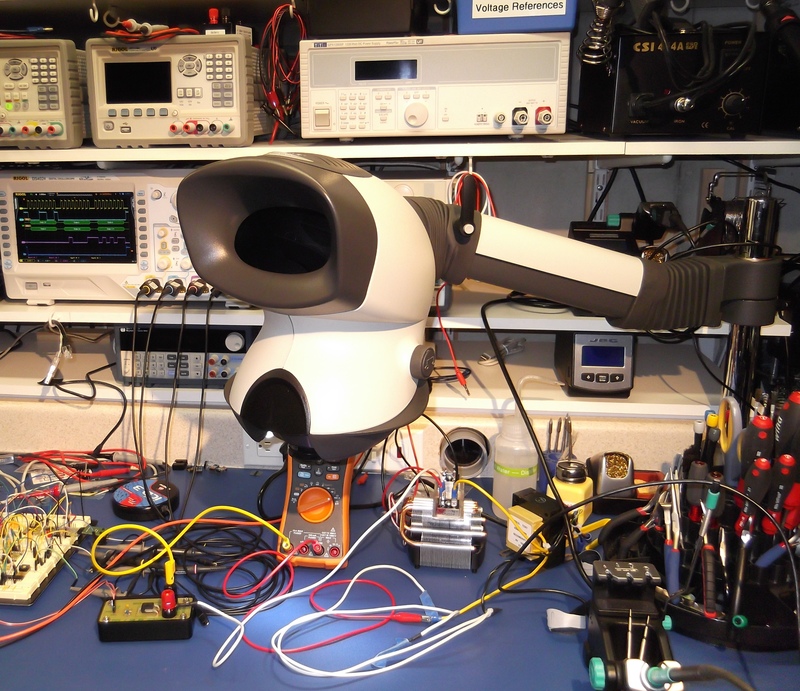 The AmScope is still handy for high magnification (up to 200x), but most inspection work is in the 4x – 8x range, and the Mantis is great for that. 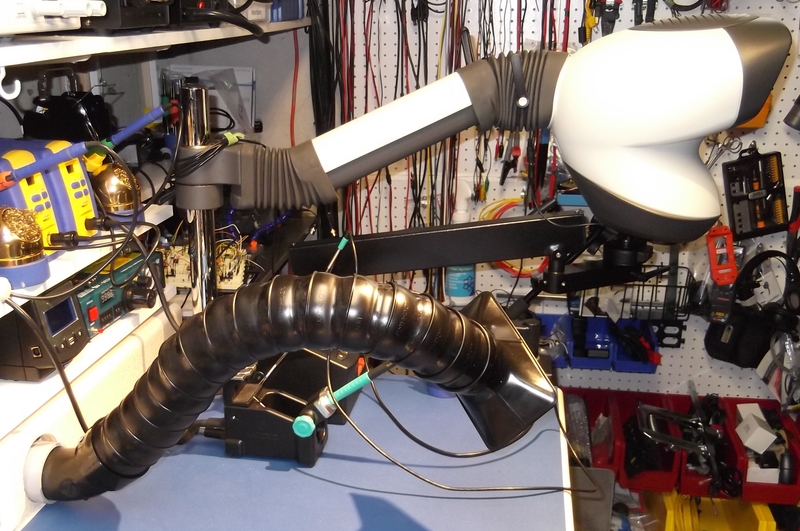 The optional articulating arm provides good reach across the workbench, and was a worthwhile option. 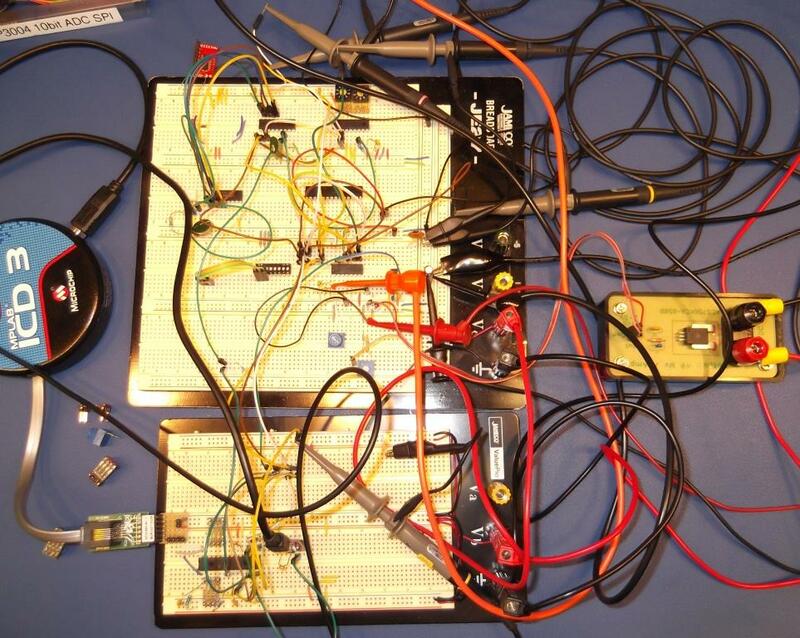 Here’s the main controller, on the breadboard, and the readings from the Vref and SPI ADC. 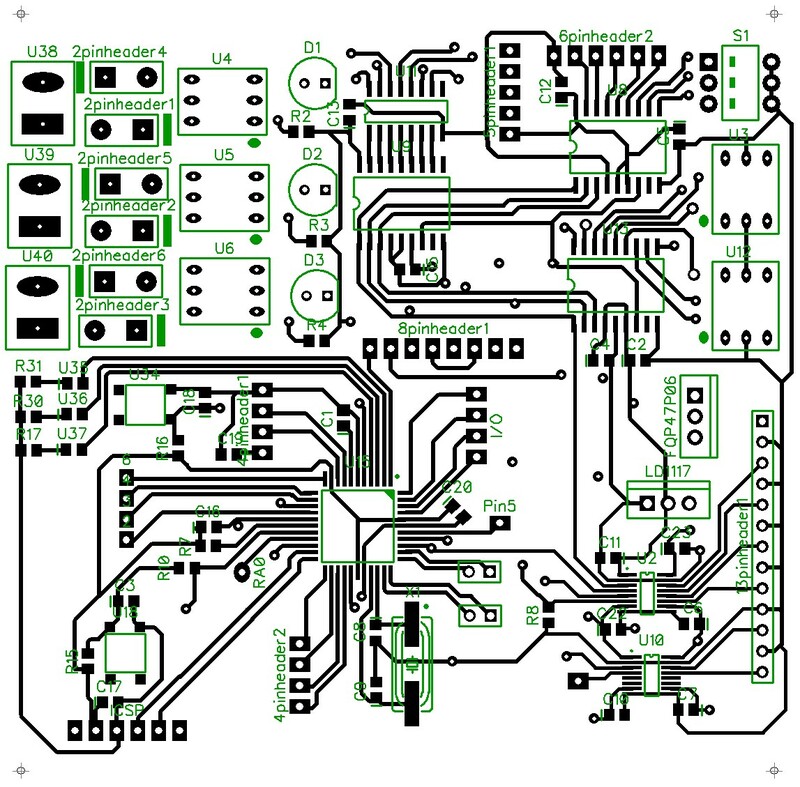 Uses a PIC18F26K22 as the main controller, reads settings from BCD switches and controls SSD relays via a pair of MCP23S08 SPI chips, beacon and marker lamp currents are measured using 50 Amp ACD756 hall-effect sensors, their output is digitized using an MCP3004 ADC set to take differential readings. As I continue to use the Microchip C18 compiler I find more and more issues. 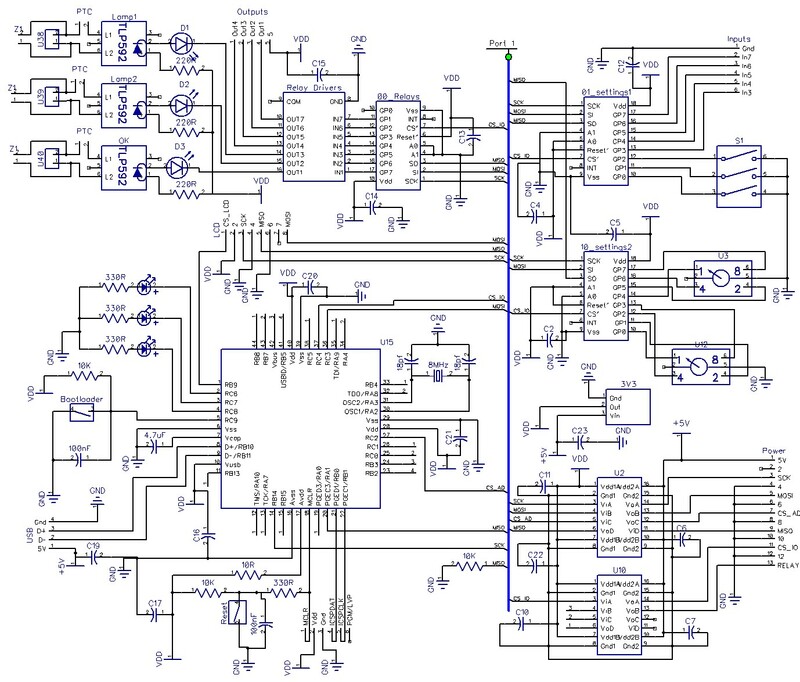 Microchip’s idiots appear to have left the peripherals lib out of the linker for the PIC18F2x/45K50 chips. 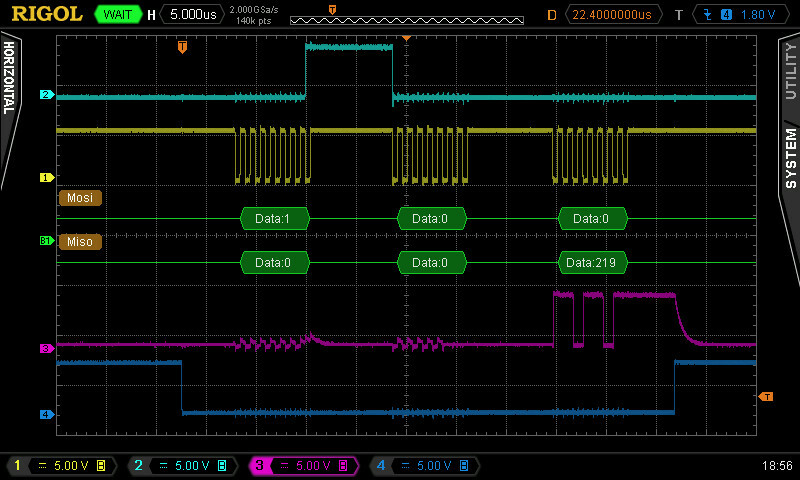 After changing over to use the K22 series of microcontrollers (specifically the PIC18F26K22), I found that the SPI libraries are missing from the linker. The USART libraries are there, but not the SPI. Keep it up Microchip, and you may yet convince everyone to use Atmel. So, I switched to an older compiler, version 3.40, and it works fine. 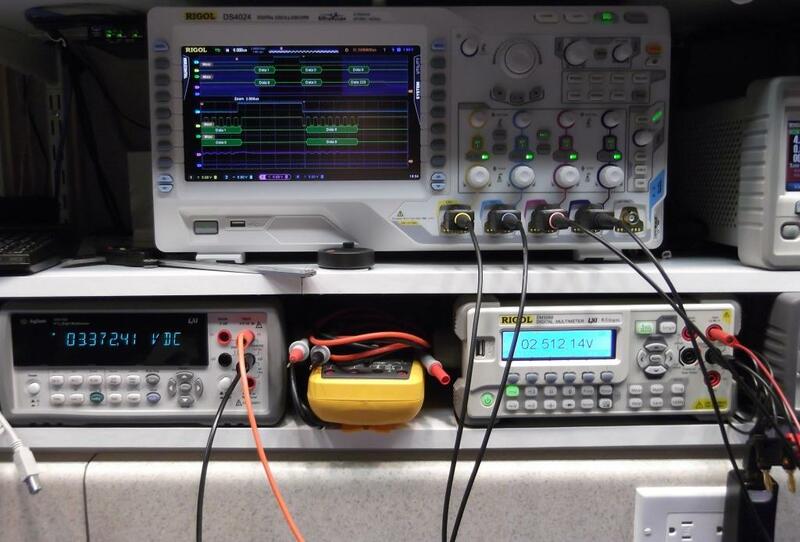 * Uses SPI to read an MCP3004, and writes the results to the serial port. // write a break and Hello to the serial port. Here’s a fancier version of the usual blink routine that also demonstrates the various options for setting the internal oscillator. * Use the PLL to quadruple the frequency.